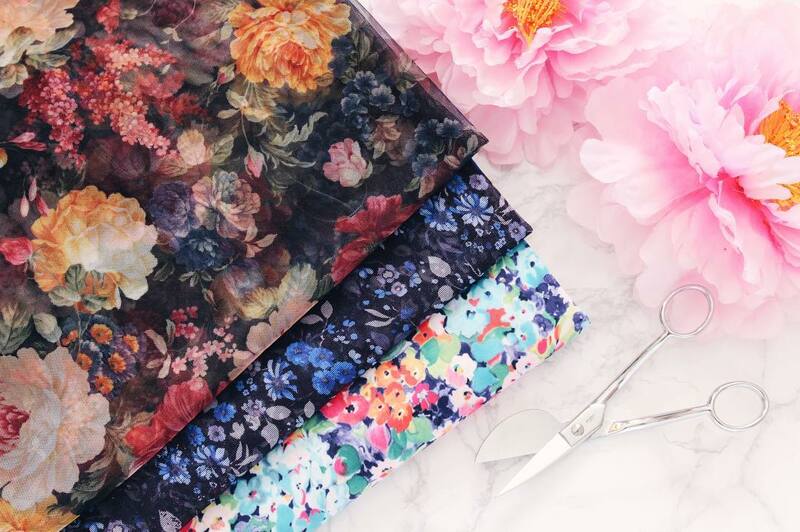 Some of my favorite floral prints in my fabric stash. Hi guys! I recently decided to start designing my own fabric, and it’s been one big learning curve for me since I don’t have a background in surface pattern design or watercolors. Since I know that we all have to start from somewhere, I thought it would be interesting and perhaps helpful to share my journey with you. To that end, I’ve started this series “Adventures in Fabric Design” to document my every step in this whole process. 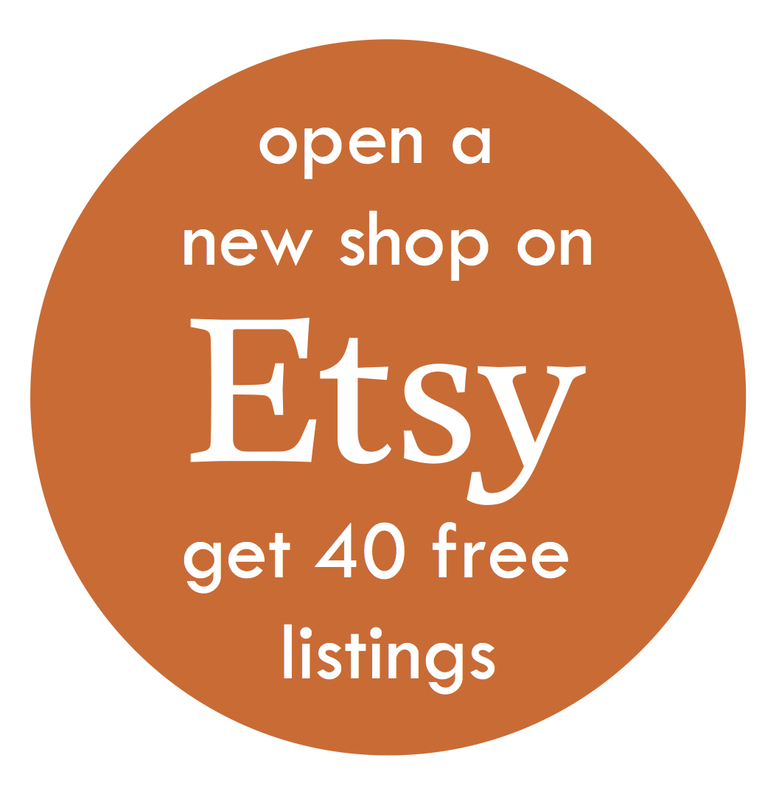 Hopefully it helps some of you who are looking get started in fabric design as well. For Part One, I will cover how I got started. Where to Start with Fabric Design? I’m a big fan of Google and I’m firm believer that where there’s Google, there’s a way. 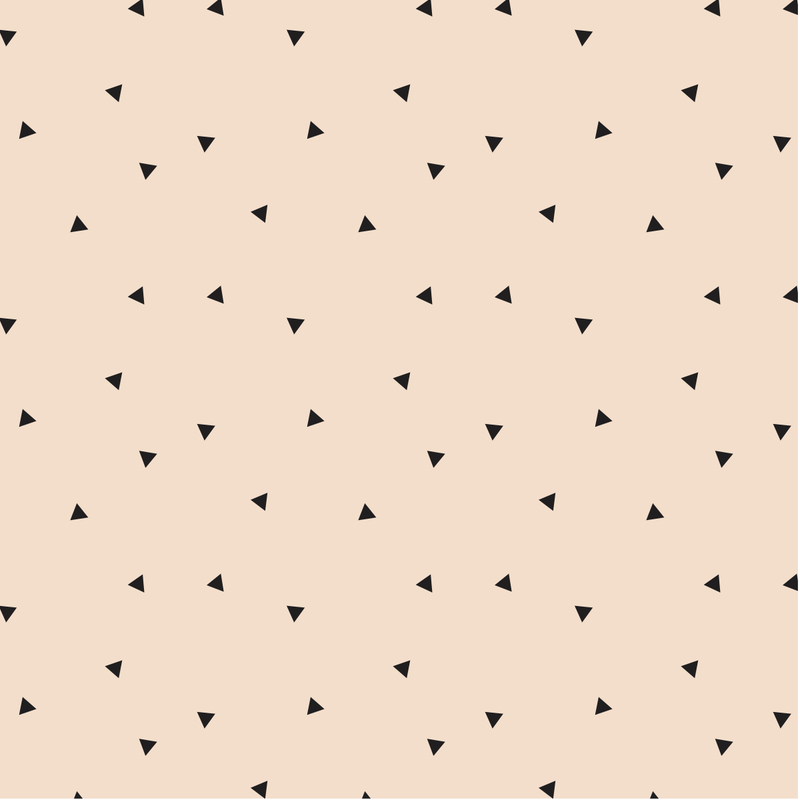 So the first thing I did was google Surface Pattern Design and see what came up in terms of blog tutorials. I needed to understand the concept of creating a repeating tile, so I devoured as many blog posts as I can on the subject. Once I thought I had a sufficient grasp of what goes into a repeating tile, I then went on YouTube to see the process in action. To my surprise, there were not many decent video tutorials on how to create a seamless pattern on YouTube. This was when I decided to look into SkillShare. At some point in my blog post reading spree, I came across Bonnie Christie’s Intro to Surface Pattern Design Class. 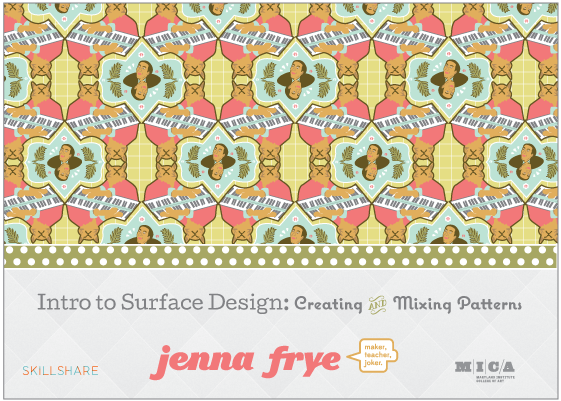 It was the recommended SkillShare class by a number of surface pattern designers. Since Skillshare was offering two months free Premium Membership on their platform, I figured I had nothing to lose by signing up. I’m glad I did! 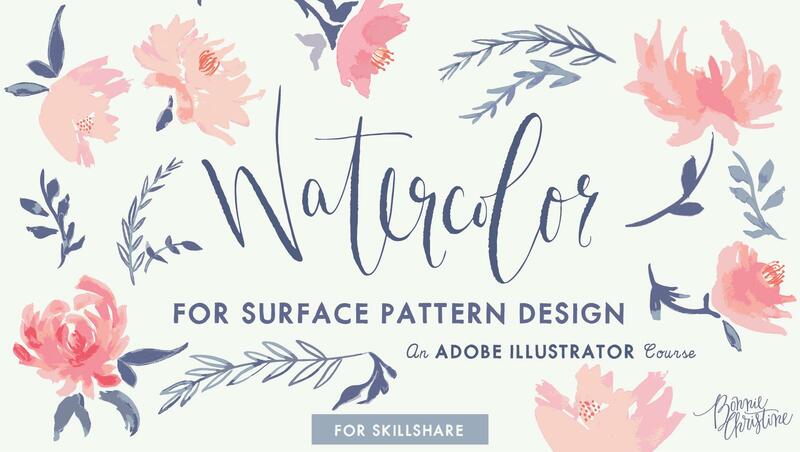 Not only was Bonnie Christie’s course super helpful, I also gained access to all other Premium Skillshare courses and that included a plethora of other Surface Pattern Design classes as well. I watched maybe a dozen total (and that’s just the tip of the ice berg) and these are the ones I recommend. If you could only take one surface pattern design class, this would be it! It’s a very complete and thorough course on surface pattern design via Adobe Illustrator. Bonnie walks you through how to find inspiration, the best method of drawing your motifs, how to use Adobe Illustrator, how to vectorize your art, how to build your repeat tile, and how to save and package your pattern repeat, and more. This is a FREE course and you don’t need Premium Membership to view it. 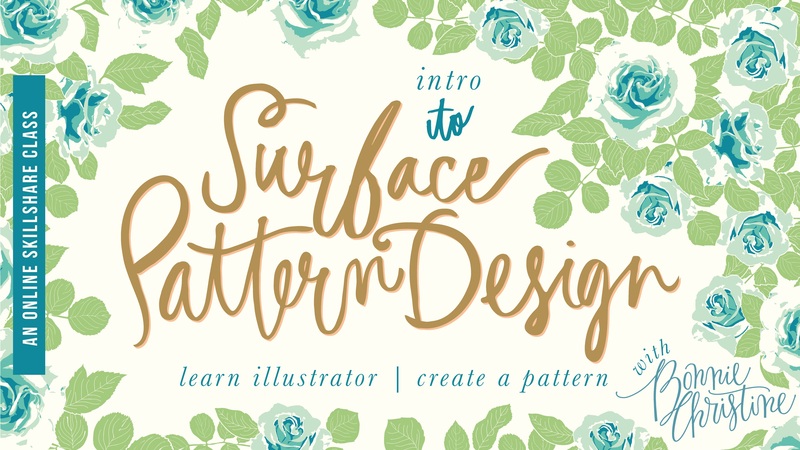 This course is unlike a lot of other Surface Pattern Design courses out there. It approaches pattern design from a very technical stand point. It’s jammed pack with technical demos and applications and it’s also a great introduction to color theory in pattern design. Bonnie Christie shares best practices of how to draw and prep your watercolor artwork for scanning and vectoring. 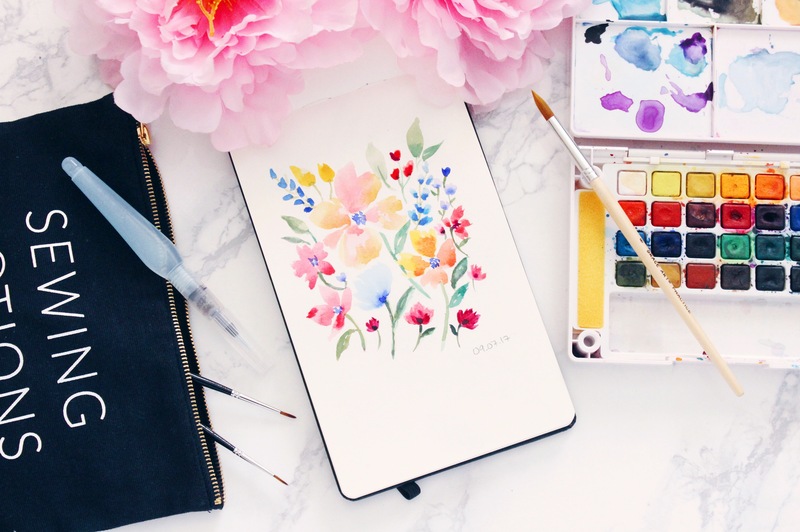 She also shares how to recolor your watercolor artwork easily and why a color gradient palette is key to maintaining the watercolor quality of your artwork. You can get two free months of Skillshare Premium Membership by signing up here! The most important thing about learning any new skill is to just get started. I could spend more time watching the other 100+ Skillshare videos there are out there on the subject of Surface Pattern Design alone, but I’ve seen enough of them that I understand how the process works. It’s time to draw some motifs. Except I couldn’t. Other than some occasional doodles, I haven’t drawn anything in nearly a decade. I was completely at a loss on what to draw. I put pencil to paper and couldn’t come up with anything. Instead of being deterred, I decided to start simple. I opened up Adobe Illustrator and created a triangle. I used that one triangle to create a seamless repeat as shown below. In the spirit of keeping things simple, I created an abstract watermelon motif next. 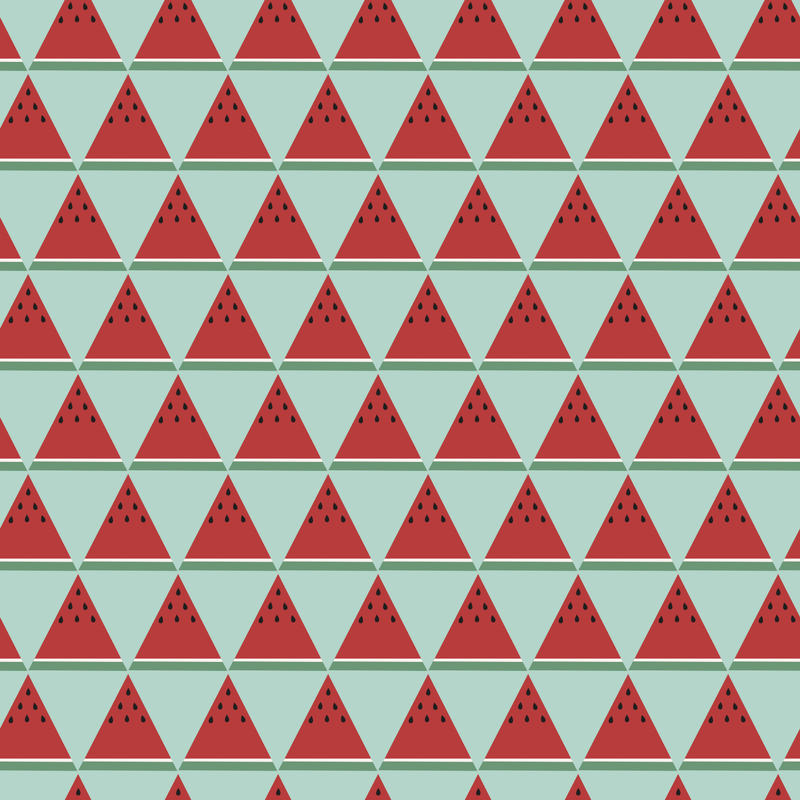 Here’s the pattern I ended up creating with the watermelon motif. Basically both of these examples are exercises in creating a repeat tile. I don’t love these (like at all) and I don’t plan on printing any fabric with them. The point of these is to make sure that I understood how to create a repeating pattern. Now that I understood how to create a repeating tile, I had to think about the kind of artwork I wanted to produce for my actual fabric designs. 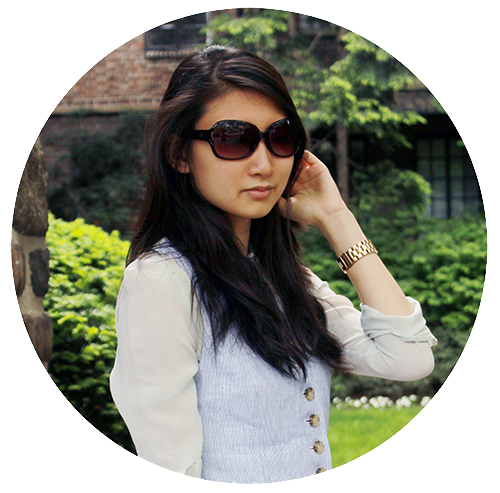 In terms of motifs, it’s pretty easy to pinpoint that I love a good floral print! There are many, many floral prints out there and yet I still have trouble finding ones in the exact design and fabric quality that I want. To solve that problem, I will be creating my own floral print designs and getting them printed on the fabric quality I want. Next is choosing a medium to create my artwork. In the past, I have worked with pastels, charcoals, acrylic paints, color pencils, copic markers, digital painting, and others. 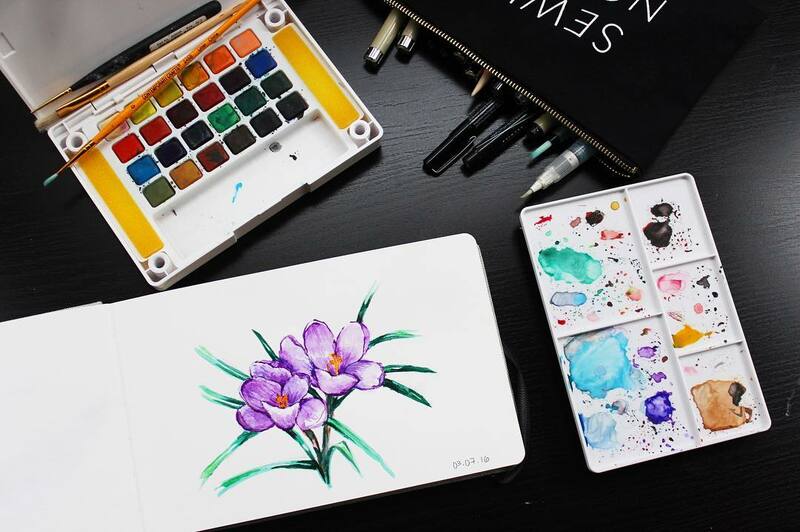 However, the one medium that really appeals to me is watercolor! And that’s a medium I have very little experience with! Watercolor croci I painted last year. I tend to use watercolor paints like acrylic paints. Fail. 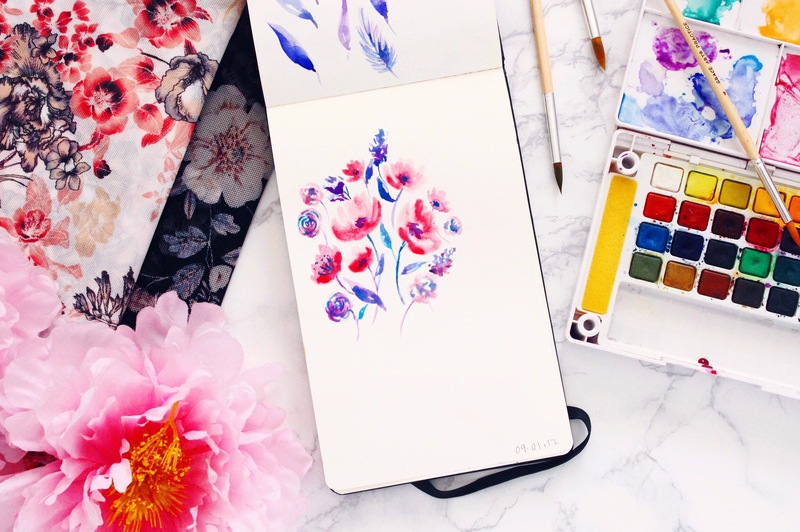 I follow a number of watercolor artists on Instagram and the put out such beautiful, vibrant watercolor floral paintings almost on a daily basis. 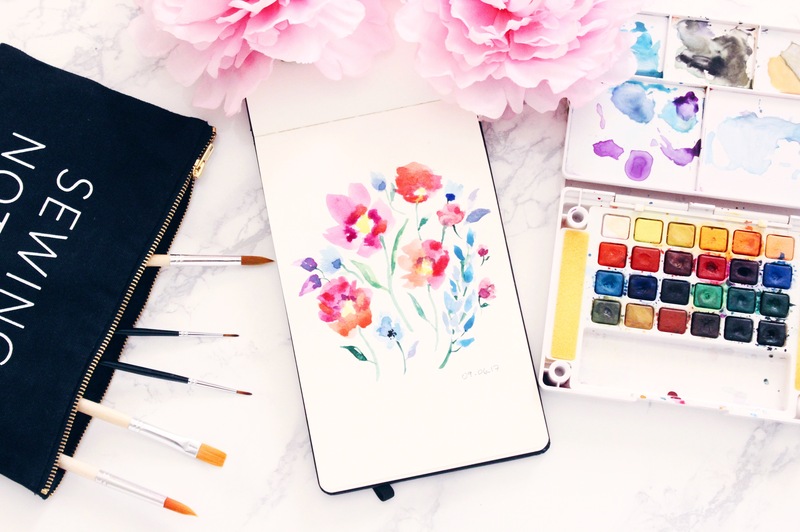 I love the soft, ethereal quality of the florals created by watercolors. 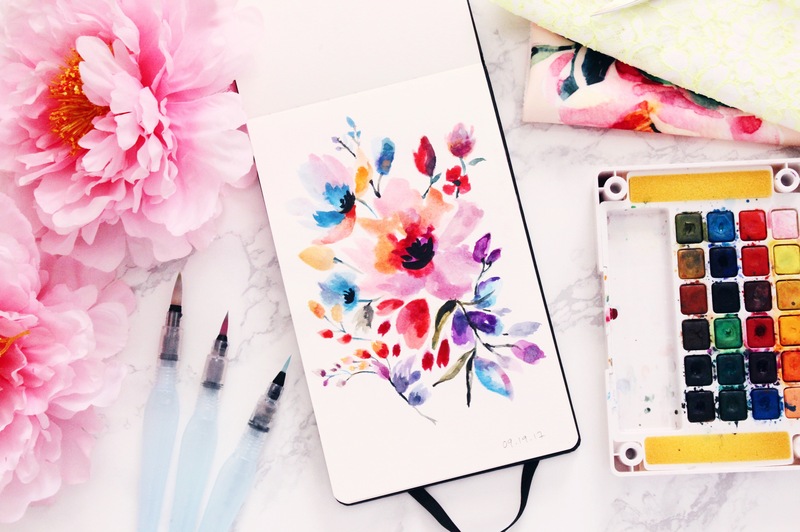 I find myself incredibly inspired by that and as a result I really want to create fabric designs with watercolor florals. So now I have to relearn how to draw AND learn watercolors. Which brings us to the Watercolor Painting Challenge. Here’s a secret. If you don’t draw consistently, your creative muscles will atrophy. In the past, I could put pencil to paper and come up with all sorts of imaginative doodles and drawings, but these days the only things that come to mind are basic geometric shapes. Before I can start creating prints, I need to relearn how to draw. Trying to draw feels like a herculean task these days, but I would like to change that! Last year, when I was on a road trip I started watercoloring (again! I’ve tried twice before that time). That habit only lasted for as long as the trip (1.5 week) and I haven’t touched watercolors since. Watercolor Floral Ring drawn last year during my road trip. It takes 30 days (or is it 21?) to form a habit, so I challenged myself to take on a 30 watercolor drawing challenge from September 1st through October 15th. I gave myself a month and a half, because I know won’t be able to set aside time every single day in September, so I am giving myself 45 days to create 30 drawings. I will try to share photos of all 30 drawings so you guys can keep me accountable! I issued the watercolor painting challenge to myself around the end of August, so I have created some of the paintings at this point. As promised, I will be sharing them with you guys as part of the accoutability system. Here are paintings number 1-5! The point of the 30 Watercolor Painting challenge is to get myself drawing again while learning watercolor at the same time. 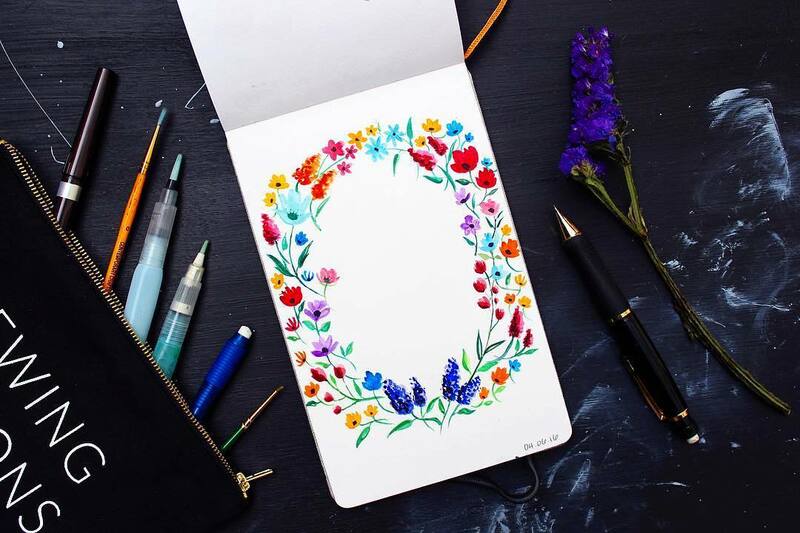 The way the flowers are drawn is currently not optimized for creating patterns. Chances are a lot of these drawings will not be turned into some sort of repeat pattern. 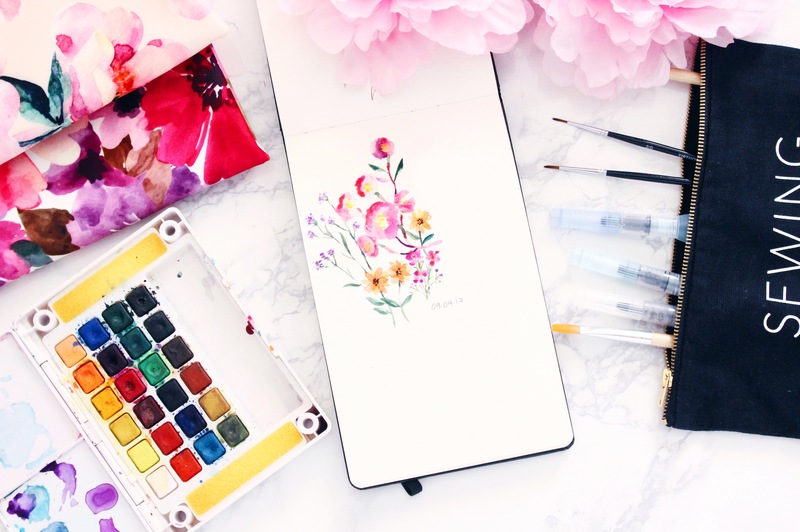 In the next part, I will share the supplies that I use to create my watercolor paintings and some tips and tricks on relearning to draw and painting watercolor florals.